Dragon Castle, is that the Mahjong game? 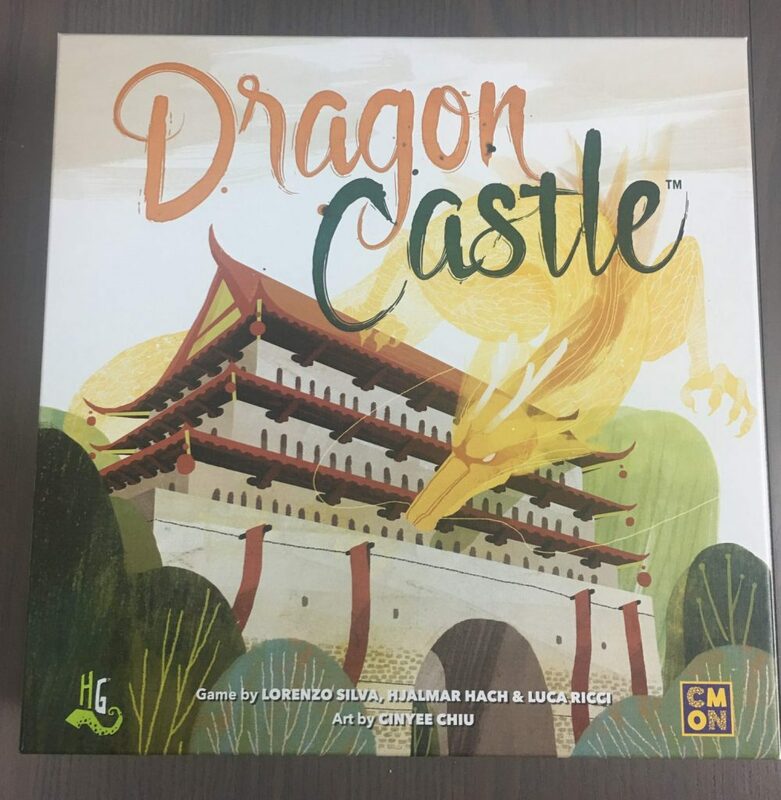 I first learned of Dragon Castle while at the 2018 CMON Expo with Justin Gibbons. When I walked in the first day, I was asked to join a Dragon Castle tournament. At this stage, I had never heard of the game. I was assured it was a beginners tournament and that I would be taught how to play. Alas, I did not win the tournament; didn’t even place. However, I did get to play Dragon Castle five times that day. And have many times since. Let’s get a bit into gameplay and then I can detail my thoughts a bit more. 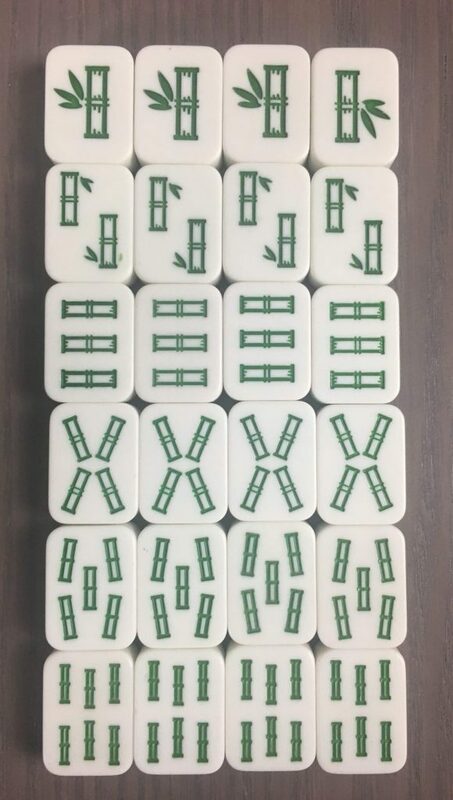 Most people have heard of Mahjong, the tile-game with its roots planted in the 18th century. This classic game, based on draw-and-discard card games, shares common origins with games like Rummy. 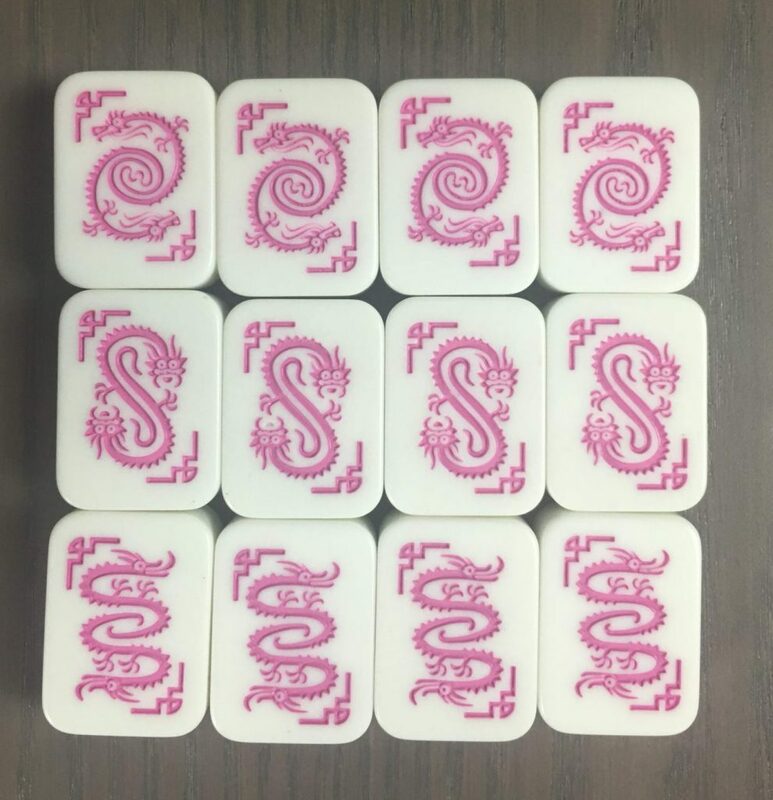 Brought to the US in the 1920’s and finding a huge boon in recognition following the adaptation of a solitaire game, leveraging Mahjong tiles, into the realm of computer games. It released under various names on both Macintosh and Windows in the late 80’s and early 90’s. The single-player matching game quickly became what most Americans think of when they hear the name Mahjong. 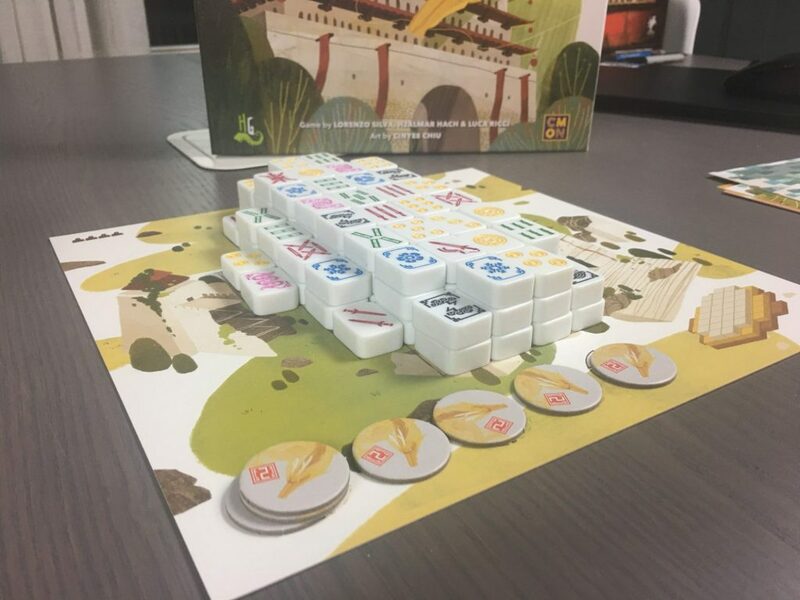 Finding inspiration in solitaire Mahjong, designers Hjalmar Hach, Luca Ricci, and Lorenzo Silva have delivered a 2-4 player tile-game which builds on the solitaire version of the classic. CMON and Horrible Games have brought the game to the US, and it delivers the quality of components and play that we have come to expect from the duo. Let’s get a bit into how the game plays. In Dragon Castle, players draft tiles from the central dragon castle, in solitaire mahjong fashion. You must take two open tiles (able to be moved left or right without disturbing other tiles) which identically match, with one twist. In Dragon Castle, one of these tiles must be from the top-most layer. 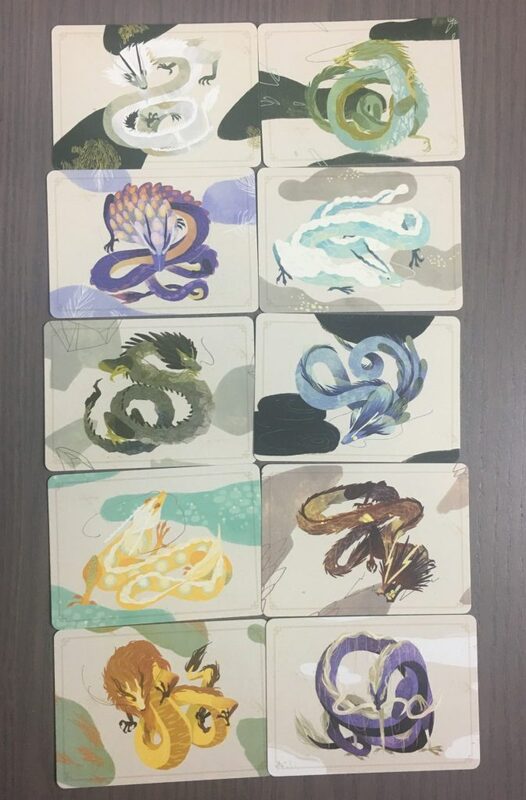 You then place these tiles onto your personal board to begin constructing your own dragon castle, with the intention of matching sets of tiles by color. The larger the set, the more points you score. Additionally, when you match a color set, you flip them and have the opportunity to build a shrine (given you have one). Shrines limit your future building options, but score you end-game points based on their placement. Let’s look at a turn in a bit more detail. On a turn, each player has four possible actions. The fourth is only available in the late stages of the game. You can take a pair of identically matching tiles from the central dragon castle. They both must be open and at least one must be on the top-most level. 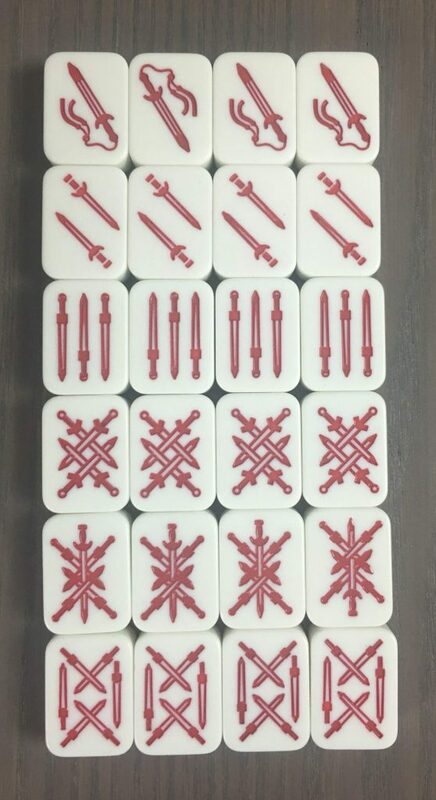 You then place these on your player board. You draft a single tile from the dragon castle, must be open and on the top layer. You place it on your player board. You also take a shrine from the common pool and add it to your supply for placement later. You remove from the game a single open tile from the top layer of the dragon castle and take one point in exchange. (only available when the central dragon castle has only its final floor remaining) you may take a dragon token from the main gameboard (right to left). Taking the second from the left dragon token is one trigger for the game end. 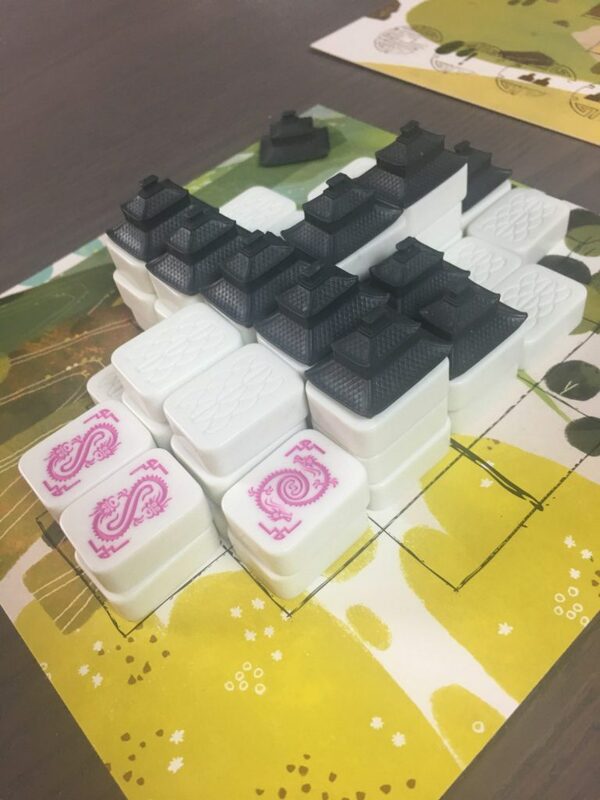 After you have selected tiles from the central dragon castle on your turn, you place them on your personal dragon castle. 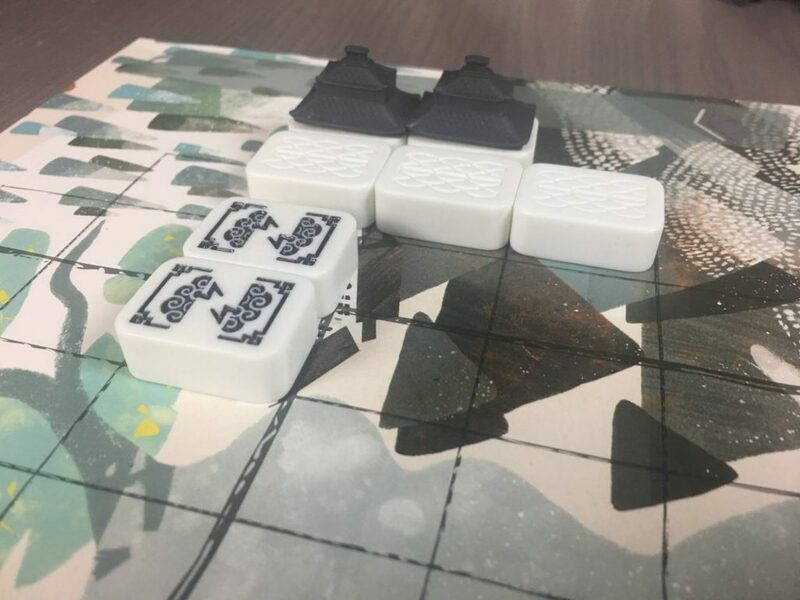 Tiles can be placed on any open space on your game board, including on top of previously flipped tiles. Tiles do not need to be placed adjacent. 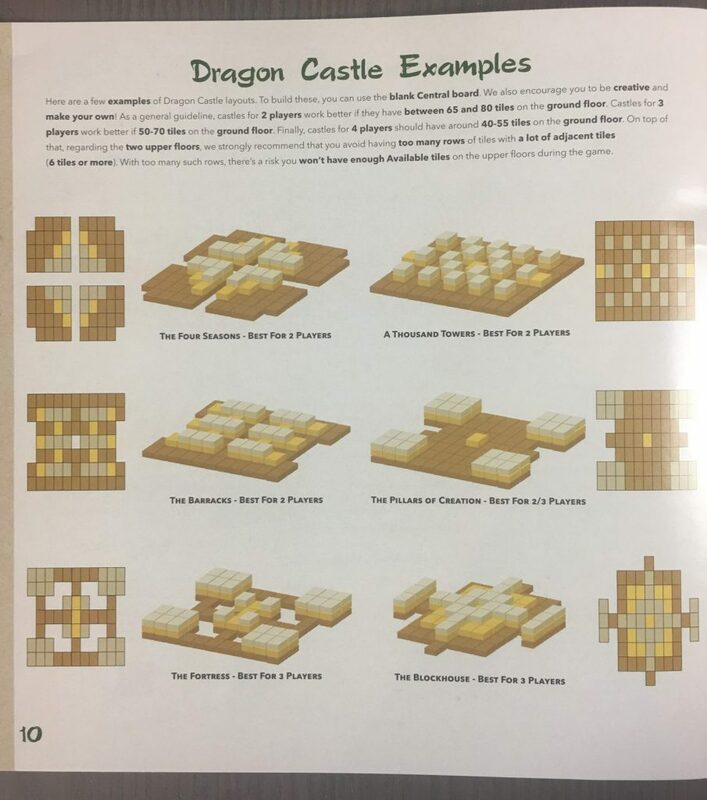 Tiles are drawn from the central dragon castle based on their symbol, but after placement, they are evaluated based on color. There are six colors (suits) in the game: merchants (yellow), farmers (green), soldiers (red), seasons (blue), winds (black), and dragons (pink). After you have placed all of your tiles if you have created a set of at least four of the same suit you flip them and score the set. Sets are evaluated based on orthogonal adjacency, not diagonals. When you flip a set, you score points depending on the number of tiles included in that set. 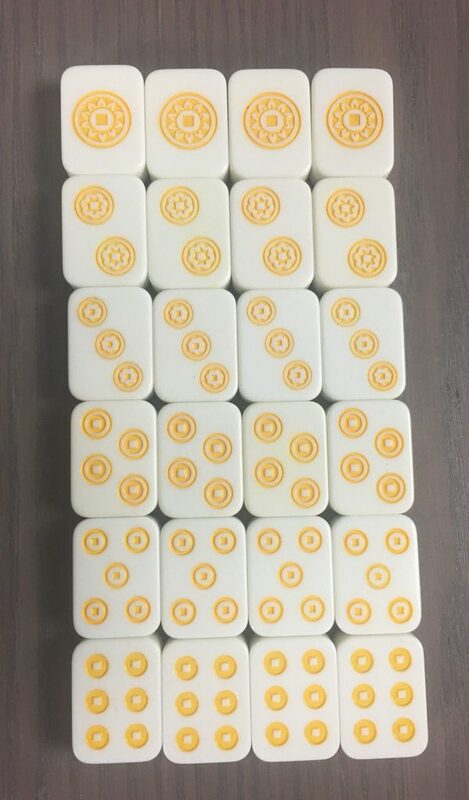 Sets score two points for a set of four tiles and up to eight points for a set of eight, any tiles over eight score an additional point per tile. Additionally, for flipping a set you have the option to build shrines onto your dragon castle on top of the just flipped tiles. Based on the color of the tile you flipped you will have the opportunity to build one (merchants, farmers, or soldiers) or two (seasons, winds, or dragons) shrines. If you flip a dragon set you also claim an additional point (this is a dragon castle after all). These shrines will block a space from being built on any longer but will score end-game points based on their location: on the first floor of your dragon castle (1 VP), the second floor (2 VP), or the third or higher floor (3VP). That’s the game! 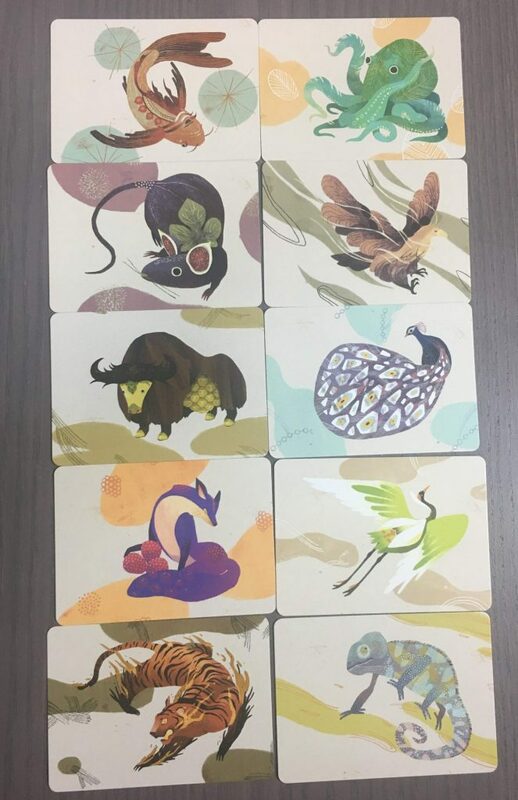 Additionally, to add to replayability and to add more depth of strategy the game comes with spirit cards, dragon cards, and variable dragon castle setups. Additionally, you can increase replayability by changing up the layout of the central dragon castle. The rulebook includes twelve alternate setups and guidelines for you to create your own central dragon castle designs. These variable setups can really alter the feel of a particular game, adding challenge through restricted drafting options. It is said about many abstract strategy games but it holds true for Dragon Castle, it is extremely simple to teach but offers a great depth of strategy. You can teach anyone this game in a few minutes and if they have experience with mahjong solitaire even less time. The game also plays fairly quickly. I would say the first time playing it will likely take near 45 minutes (what’s printed on the box) but after the first game, you will play this game much faster. I can’t talk about Dragon Castle without mentioning its table presence. This game is beautiful; fantastic art on all the boards and cards and beautiful chunky tiles (these things have some weight). Not to mention the fact that they are stacked into a lovely structure to start. As the central dragon castle becomes ruined with each player’s turn, you see these smaller dragon castles growing out of the rubble. The personal dragon castles look amazing, with their multiple levels and shrines. The one thing I dislike is some of the choices for tile patterns. The suits are easy to tell apart, they have different colors and the symbols between suits look very distinct. However, within suits, I think there could be some improvement. We will start with the three basic suits: merchants (yellow), farmers (green), and soldiers (red). These suits offer fairly good distinction, though I have seen some new players struggle in differentiating the high count soldiers. This differentiation is key as you must draft two identical tiles from the central dragon castle on your turn. When it comes to the special tiles: seasons (blue), winds (black), and dragons (pink), most players have no difficulty with seasons or winds, though they are less clearly differentiated than the basic suits. The real issue comes with the dragon tiles. These three dragons are so easy to confuse, even for experienced players. After many plays, I have gotten a good eye for them but I feel like I must constantly police because other players often confuse these when in the context of the central dragon castle. I really like Dragon Castle. It has found a solid place in my collection. It has such a low bar to entry, it’s quick to teach, and it looks enticing. Especially with newer players, I have to be extra vigilant, paying attention to what tiles are drafted. As I mentioned, players often confuse dragon tiles. Additionally, it takes players some time to get used to the concept of open tiles and remembering that one must come from the top. I have found that players often get caught up in finding the sets they need for their personal dragon castles and forget about these simple rules. In my book, this is a good sign. I’ll happily play police if it means that everyone is so caught up and engaged that they overlook these restrictions on their first few plays. I also enjoy that this game offers an accessible but strategic experience for up to four. It is worth noting that though the game scales well, it does offer a different experience at the two vs. four player count. At two-player, this game has a strategic feel more like chess. Paying careful attention to each of your opponent’s moves, drafting to disrupt their strategy, planning many moves in advance. At four-player, this game is a bit more casual. It still offers strategic play but it is much more difficult to anticipate your opponent’s moves or to plan many turns in advance. I personally enjoy both experiences. For many, one will be preferable. 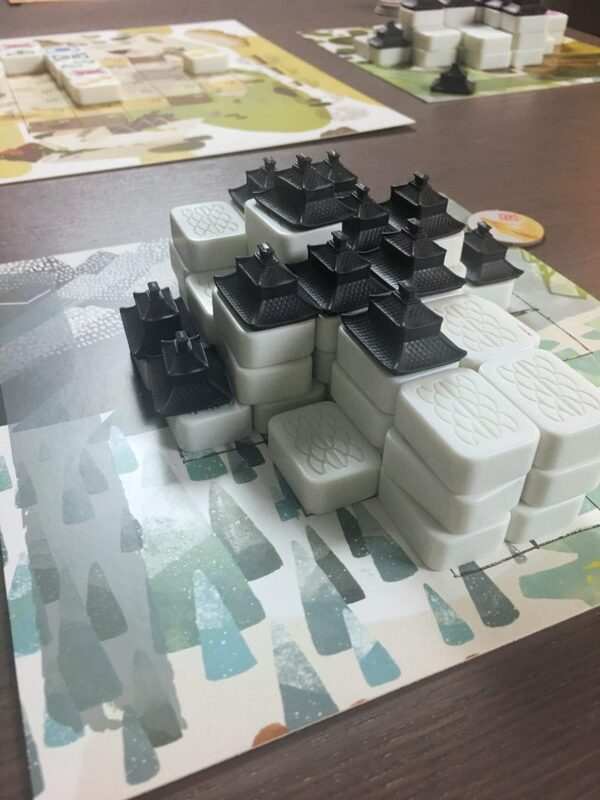 If you’re looking for a beautiful abstract strategy game that can host up to four players, a game that can be presented to players regardless of their gaming experience, and that can be played in under an hour you should think about adding Dragon Castle to your game shelf. With all of the variability offered by the many setup options along with the possibility of adding spirit or dragon cards, this is a game that will stay fresh from play to play. 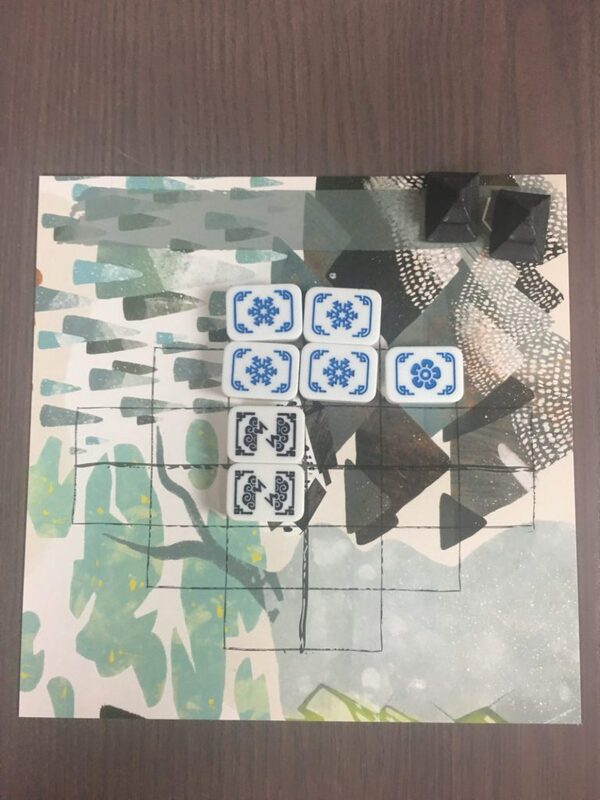 Or if you are a fan of Mahjong Solitaire or any of its many variations on the computer (Horrible Games just recently released an official solo variant which can be found at their website) give this game a look!